Yesterday I returned back from Denver, Colorado. There is a two hour time difference with New York, so I slept just 6 hours and feel a bit groggy (even after the cold shower). Quality sleep is important, but whatever – will get it next time. It was an awesome little trip. 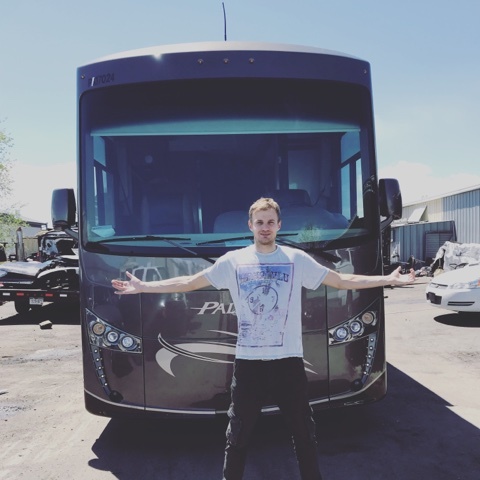 One of our friends who live in Denver owns an RV so we loaded a bunch of people (plus kids!) and drove it to the mountains. A lot of fun and unforgettable memories, but the primary reason for the visit was to meet with my financial app partners and discuss some important business decisions. Initially, we started building our app on the SalesForce platform (don’t ask me why) with the eventual goal of migrating away to our own webapp. The problem was that we didn’t want to waste a lot of time building webapp from scratch, that’s why we were considering buying and adopting someone else’s codebase along with some dev support time for the initial changes that we needed. Not an easy decision to tell you the truth… There is a very strong temptation to hire your own team and build the app in-house, but at the same time, you don’t want to miss that window of opportunity and get the product on the market as soon as possible. While there, I was invited to another meeting where I was introduced to the two very smart guys. They came up with the technology to segment customers by analyzing a bunch of data points and then use those “digital fingerprints” to find and sell to similar audiences. It resembles something similar to what Facebook does with their look-alike targeting, but much more fine-tuned and cross-platform. The system was working so well (reduced impression to conversion ratio from 1:10 to 1:3! ), that the company reached the ceiling in terms of transactions that they could process in a day and were looking for new payments processor that would allow them to scale up the business. I was very impressed and more importantly, I felt “alive” by being surrounded by people that create something out of nothing. Why did I tell you all of this? Well, for one I wanted to give you a real-life example where only a handful of people with the help of modern pay-as-you-go cloud services and a lot of hard work could create something awesome and financially rewarding. Some time ago I was looking for the plugin that would allow me to create a popup on my blog. Anyway, I didn’t want to create it myself (I could, but I intentionally refused to!) and decided to find some simple off the shelf solution. After browsing WordPress plugins directory I found the one that looked promising. It was called Popup Maker. The installation and configuration was a breeze, I was able to setup basic popup in no time. That’s when I noticed the Popup Maker Extensions link! 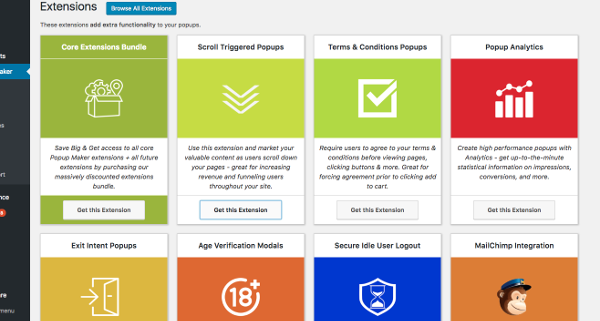 Guess what, there were my Exit Popup and Advanced Theme Builder extensions. Great! “Get this Extension” button took me to the store page. To be honest, I was prepared to pay, but I didn’t expect that a simple scroll trigger extension would cost me $35 for a single site license! As I was browsing extension store, I quickly realized that it would cost about a $1000 to get them all. 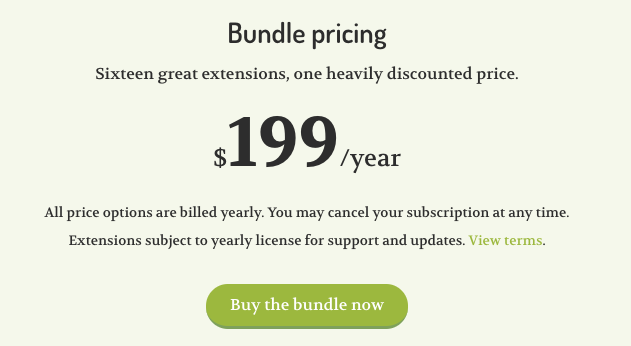 Then I discovered the Bundle link which offered to buy all of the extensions for one simple payment of $199/year. Now, I know that some of you may think “Whaat? A $1000??! Are you crazy?! 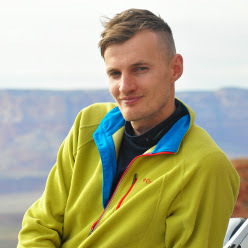 It’s a ripoff and that functionality should be free and opensource!”. Let me stop you here for a second. Clean your mind and think of it this way – if all I have to do to solve my current problem is to pay $199 and save hours of my time (likely days or even weeks if I’ll want to code some of the functionality that I needed), does it makes sense to just buy it? Hell yes! I have literally zero free time so I did. On top of the extensions, I’ve got ongoing support and updates for a year and a license to use the plugin on as many sites as I needed. Tell you more, if you are not the coder (the majority of the population) then buying pretty much becomes the only option. 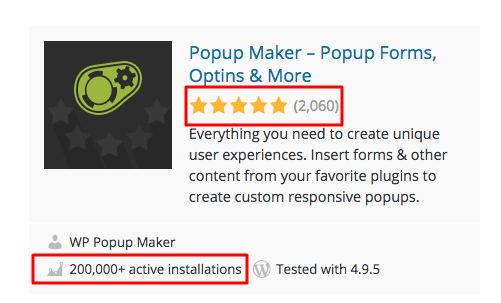 Here is the last thing I want you to consider – the Popup Maker plugin has over 200K active installations according to WordPress page and a 5-star rating! The majority of the installations are probably for the free version, but I bet there are a lot of paid recurring subscriptions as well. They turned a simple concept into the platform and I think it’s brilliant! The best part is that you don’t need a huge team of people to develop a product that can create some financial foundation for your future success (additional income stream at the very least). I’ve made a mistake of bundling all of the possible features into my own plugin and selling it for $14.97. While I did make some money, it wasn’t enough to sustain the on-going development and support, so I slowly gave up on it. If I were to do it again, I would definitely try to convert it into “platformer” and set a price tag according to the amount of value it delivers to the client. Ok, here we go. I was planning to talk about something else but somehow I ended up writing about the plugins pricing strategies. Fine by me. Hope it gives you some ideas and a bit of inspiration. Remind me next time to tell you a story about a guy named Dana Derricks who sells books for up to 4K a piece. Yep, that’s right – regular books that people sell for $10. I didn’t buy his most expensive book yet, but I’ve got two of them. In the end, it’s not about the price tag but the value you create for other people! The sky is the limit as long as you position and present (package) it correctly. Ok, have to wrap up now. Remember one thing – the world is full of opportunities and amazing interesting people. It’s true. Here is the catch though, you need to start exploring outside of the known boundaries in order to find them.